Front row: David Coldwell, Paul McCarthy, Perry Digweed, Nicky Bissett, Brian McKenna, Wayne Stemp, Steve Gatting. 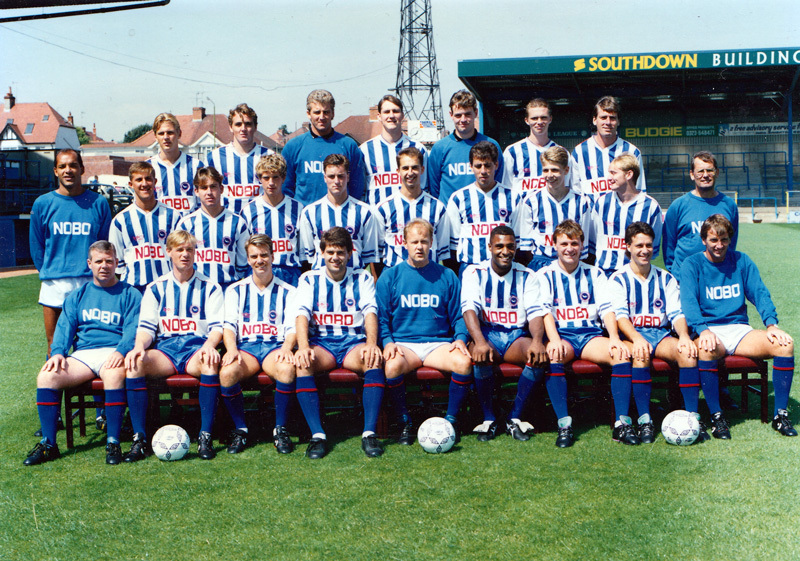 Middle row: Larry May, John Robinson, Derek McGrath, Chris Lyons, John Crumplin, Adrian Owers, Gary Chivers, Stuart Munay, Lee Cormack, Ted Streeter. As football hotbeds go, Brighton must rate as cold to lukewarm. Tradition still has a firm grip on the cosmopolitan capital of the South Coast, with a mix of affluent and bohemian lifestyles distracting the locals away from any intense sporting passion. Until that amiable Scouser Jimmy Melia danced his way to stardom in I983, Brighton & Hove Albion had to regularly take a back seat. Brian Clough briefly woke them up in the late ’70s, but it wasn’t until that famous flight to Wembley that anyone took the Seagulls seriously. Apart from the two promotions and two seasons in Division One under Alan Mullery, of course. Even on Cup Final day itself, as the players announced their arrival at the old stadium courtesy of a British Caledonian helicopter, the romance seemed to go too far – perhaps they forgot they were still a First Division club (sic). These days, the legend of Gordon Smith’s extra-time miss still looms large in Brighton folklore – but more as a joke than a sign of despair. Meliamania did not last long after the 4-0 drubbing handed out by Manchester United in the replay, and the club has since gone back into its shell. 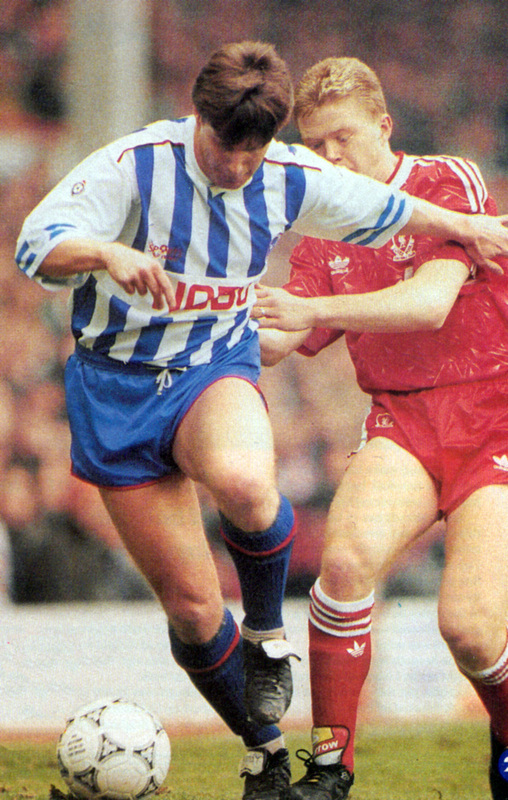 But all that could change this year, as Brighton once more challenge for a place in the First Division. 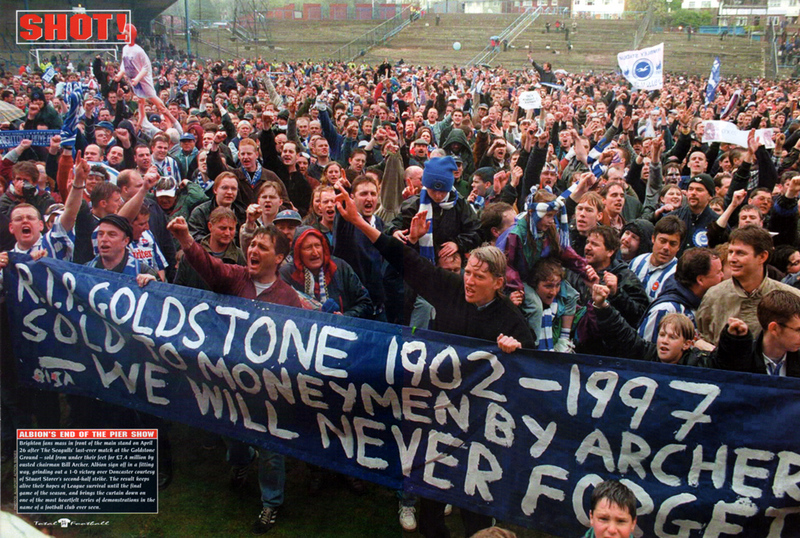 After last season’s modest effort, many tipped them for relegation this year, but the wise heads at the Goldstone Ground had other ideas. As the Second Division promotion race opens up, with the top three all dropping crucial points, the Seagulls have suddenly found themselves thrust into the heat of the battle. An impressive 3-1 win at Bristol Rovers on Easter Monday shot them into fourth place, and now, even the town’s Saturday shoppers stop in their tracks when they look at Final Score and realise what’s really happening. Leading the way this time is Barry Lloyd, a low-profile, lower-division man quite unlike the flamboyant, carefree Jimmy Melia who so personified the great Cup adventure. Lloyd started his playing career at Chelsea in the 1960s, alongside George Graham, John Hollins and Peter Osgood, but after failing to break into the big time he learnt his trade at Fulham and Brentford as a robust defender and midfielder. 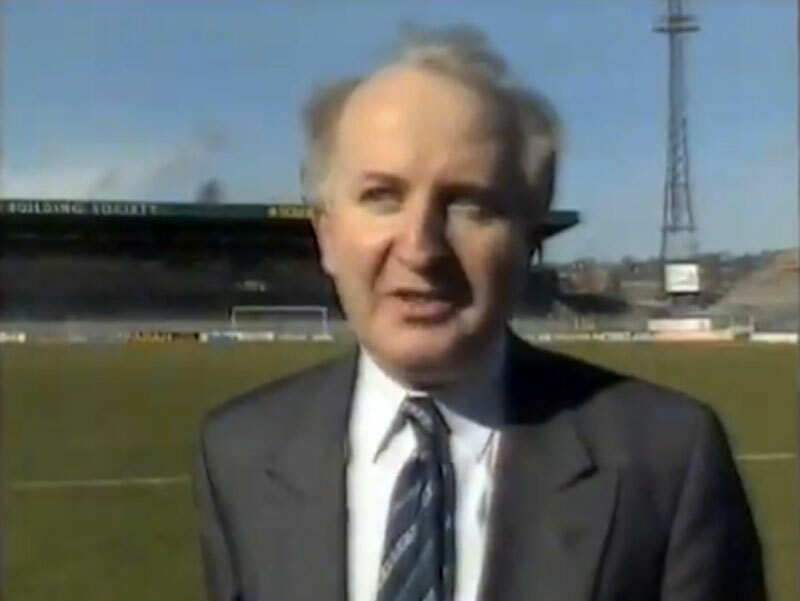 His first taste of management was just as humble – on the famous Huish Park slope at Yeovil Town. Lloyd came to Brighton as a coach under Alan Mullery, his skipper at Fulham in the 1975 Cup Final side. The majority of the team stayed on when he took over in January 1987, and with Steve Gatting, Gary Chivers and Dean Wilkins still around. Lloyd is not surprised at this season’s lift-off. John Byrne in action. Did we really mount a promotion bid wearing this? Inevitably, Lloyd refers to his new strikeforce of Mike Small and John Byrne. Their partnership has blossomed this season, with both players looking to make up for their respective periods of wilderness in Greece and France. undertook at the end of last season. 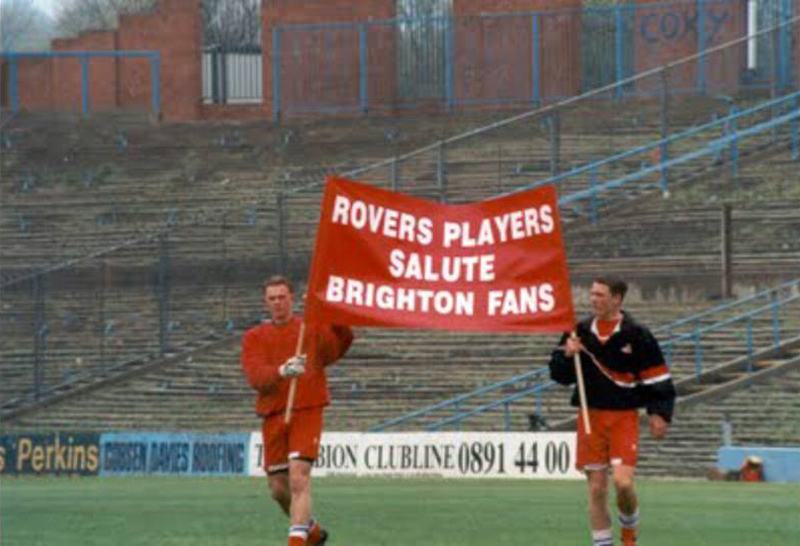 Byrne’s renaissance will delight those fans who like their football played with a bit of style. The Irish striker’s career took a nasty deflection after he briefly donned the famous QPR No.10 shirt once worn by Marsh and Bowles, but a fruitless spell at Le Havre has made him hungry for a second chance – and perhaps even a place in Jack Charlton’s international plans. But it’s been the nomadic Mike Small who has hit the headlines this season with his powerful presence in the penalty area. Eight years on the Continent, drifting from Standard Liege to Twente Enschede to PAOK Salonika, may make him a great advert for EuroRail but his move home has resurrected his career. Small already has 19 League goals this season, and armchair fans will remember his contribution in the Cup matches with Liverpool. In the first game he scored and then set up Byrne’s spectacular equaliser, while in the replay he had a perfectly good goal disallowed while the one that counted was miles offside. The Seagulls were ultimately caught out by Liverpool’s late rally that night, but their confidence was clearly boosted by their performance. To Lloyd’s amazement over 5,000 Brighton fans winged their way to Anfield for the first match – a sure sign that the club was on its way back. 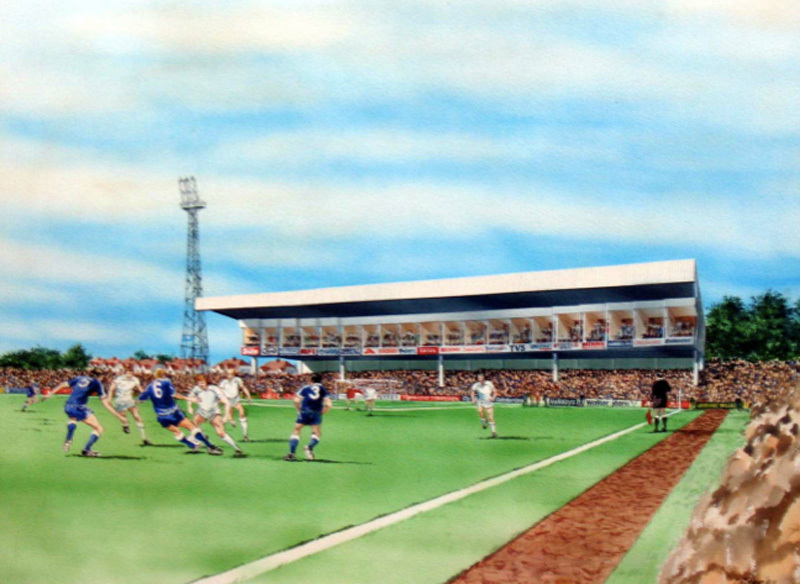 But although over 20,000 filled the patched-up Gotdstone Ground for the replay the Brighton public have yet to be stirred into action by playing Liverpool next season in the League. “To be honest, we’ve been disappointed with the response, particularly after they made such an effort for the Cup,” says Lloyd. “Hopefully they’ll be back when the crunch comes.” As you might expect, Lloyd firmly believes nothing will be decided until the last kick. With the three-point system and the play-offs making the Second Division even more of a dogfight, he has wisely chosen to enhance his resources. Colin Pates was recently rescued from the Highbury reserves and put straight into central defence alongside his former Chelsea team-mate Gary Chivers. With Steve Gatting slotting in at left-back, Perry Digweed in goal and Clive Walker still speeding down the wing, there is plenty of First Division experience. Indeed, jokes about ‘Dad’s Army’ taking the Division by storm are already flowing thick and fast. The over-30s also include transfer-listed striker Garry Nelson. who has scored in the last three games in the three games in the absence of the injured Small, For Gatting, the only remaining member of the 1983 Cup Final team still at the Goldstone Ground, the season has been an unexpected bonus. With brother Mike temporarily out of the cricketing (and tabloid) limelight, he hopes the Gatting name can soon return to the back pages. “Before the Cup Final, we had a good season in the First Division and that was probably the best side I played in,” he recalls. “But this side compares very favourably. The team is a lot steadier now than it has been for the last two seasons, when we’ve played well but not got the results. As the final stretch approaches, however, the growing optimism on the pitch is being checked by uncertainties off it. Already, plans have been made for a new 25,000 all-seater stadium outside Brighton to comply with the requirements of the Taylor Report but with debts running into millions, the Seagulls are approaching the First Division on rocky ground. Yet while the commercial wranglings continue, Lloyd knows the best job he can do is on the pitch. His collection of experienced pros are all looking for that chance to haunt their old enemies, and the younger players are having a fling too. Both Paul McCarthy and Derek McGrath were in the Irish Under-21 squad which tost 3-0 to England at GrifTm Park, while local tad John Robinson has emerged as a new talent in midfield alongside Dean Wilkins. New executive boxes in the North Stand! If you study it carefully, you can see twenty executive boxes above advertising boards for companies such as TVS and Caffyns. 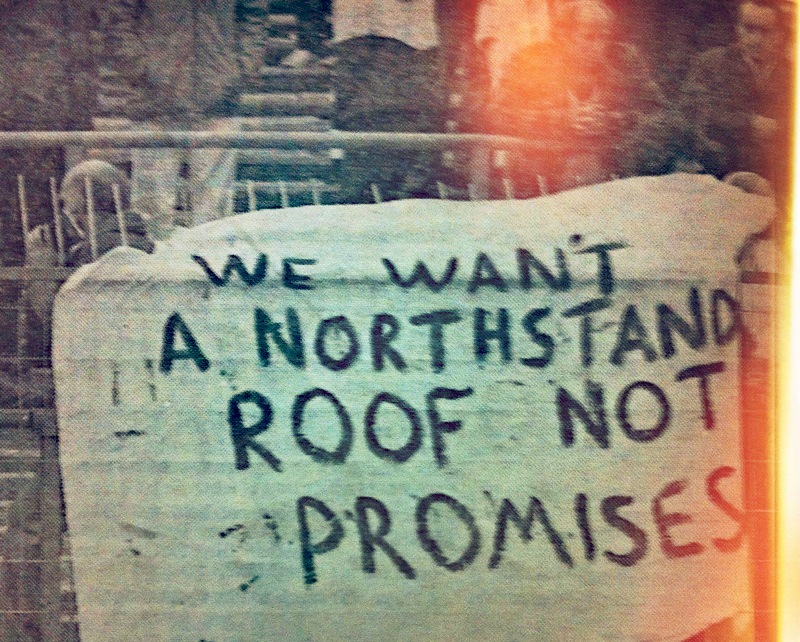 In the end, a plain roof was built over the North Stand. 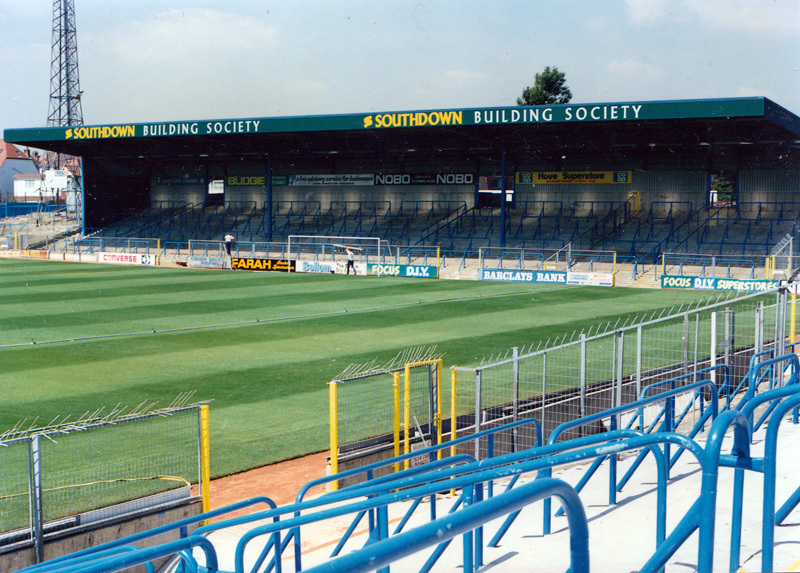 But for those still dreaming of executive boxes in the North Stand: the drawing board went that-a-way! 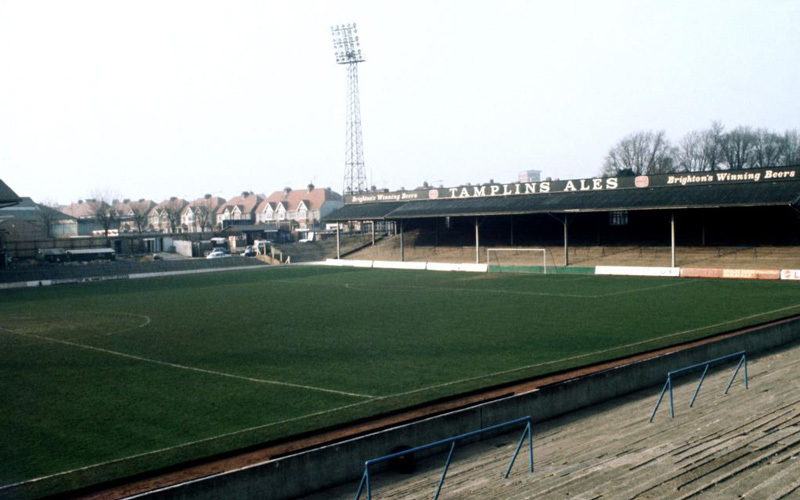 With its rather jolly looking Tamplin’s brewery advert and clear view of many people’s homes and gardens, the Goldstone Ground in 1972 may not look like an intimidating sight. 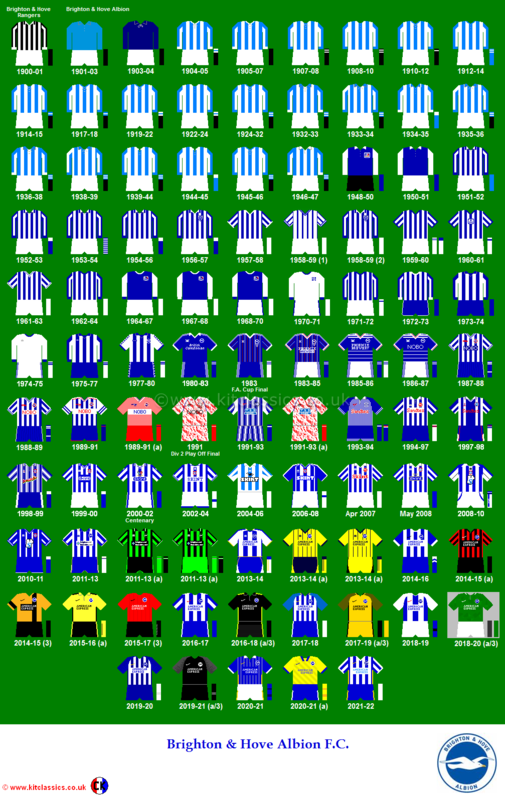 However, it is where Brighton & Hove Albion showed sufficient form to clinch promotion from the Third Division in 1971/72. Pat Saward’s men won an impressive fifteen home league matches out of 23, with the Goldstone roaring the side on in the decisive 1-1 draw with Rochdale in May. If you look closely, you can see that the club kept supporters up-to-date with the alphabetised half-time scores on the side of the pitch. I don’t know about you, but these renovations don’t look that impressive! Still, it was probably the best that could be done. There was a lot less money to play about with at the club compared to later on in the decade.